HP 952XL Black High Yield Original Ink Cartridge (F6U19AN) for HP OfficeJet Pro 7740 8702 8710 8715 8720 8725 8730 8740 | Replicafer Co.
HP 952XL Black High Yield Original Ink Cartridge (F6U19AN). 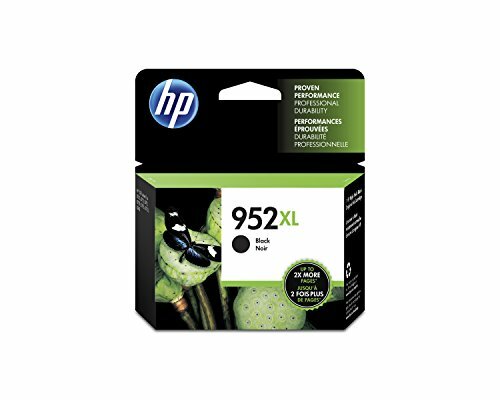 HP 952 ink cartridges work with: HP OfficeJet Pro 8715 (J6X78A) ; HP OfficeJet Pro 8210 (D9L64A#B1H) ; HP OfficeJet Pro 8725 (J7A28A) ; HP OfficeJet Pro 7740 Wide Format (G5J38A#B1H) ; HP OfficeJet Pro 8740 (K7S42A#B1H) ; HP OfficeJet Pro 7720 Wide Format (Y0S18A#B1H) ; HP OfficeJet 8702 (M9L81A) ; HP OfficeJet Pro 8710 (M9L66A#B1H) ; HP OfficeJet Pro 8720 (M9L75A#B1H) ; HP OfficeJet Pro 8720 (M9L74A#B1H) ; HP OfficeJet Pro 8216 (T0G70A#B1H) ; HP OfficeJet Pro 8730 (D9L20A#B1H) . Cartridge yield (approx. ): 2,000. Get up to 2X the pages with Original HP XL ink cartridges compared to standard cartridges. Original HP ink cartridges are specially designed to work with your printer to consistently deliver standout results throughout the life of your cartridge. Ensure that your printing is right the first time and every time with HP printer ink: 952 ink. What's in the box: New Original HP 952XL ink cartridge (F6U19AN) Color: Black.